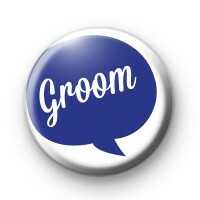 This fun wedding badge is 25mm (1 inch) and has a blue speech bubble with Groom written in a fun handwritten style font. These badges are great for your special day and add a handmade element to your wedding. Fantastic little extras to give out to the Groom & Bridal Party. We have a massive range of hen party badges, stag party badges and wedding themed badges available in our hen, stag & wedding category and many of our badges can be customised on the website at no extra cost. Be sure to take a look through the category and pick out your favourite badges. Perfect for the bride, groom, best man and maid of honour, not to mention your flower girls and bridesmaids. 25mm button badge made in our workshop & available for worldwide delivery. The perfect cheap button badges for your big day.